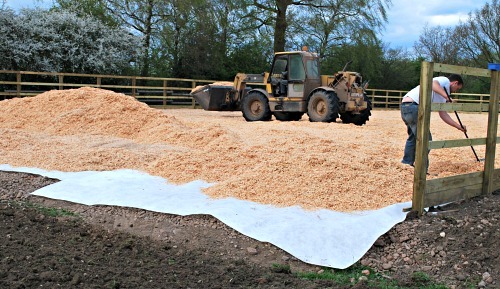 Wood fibre is produced especially for equestrian surfaces and usually consists of smaller particles, whereas wood chip can be anything out of a timber merchant’s chipper. The particle size of wood chip is important. If the pieces are too large it will not settle and can become lodged in hooves; if the pieces are too small and lightweight they may blow around in the wind. Wood-based surfaces are eco-friendly if not treated with chemicals or colourings. Recycled wood, however, should be treated with caution since it could contain old nails, wire or staples from a previous life as a kitchen unit, door, window frame or pallet. A wood-based surface is less prone to freezing than sand, depending on the quality of wood and bark content. A surface that doesn’t contain bark will last longer and will not absorb as much water. Every few years it will need topping up. This is what I have at home – basically there is only me and my horses that use it and at the time when we built the arena it was the best we could afford. All the wood was virgin wood rather than recycled which you pay extra for, but should last longer. A rubber-based surface requires less maintenance, and is less likely to become waterlogged or dry out. A big advantage of rubber surfaces is that they should not generally freeze. Rubber is dust-free and is unlikely to blow around in a strong wind. It’s not generally recommended for indoor use. In hot summers, the surface can heat up, producing an unwelcome smell. The most important point about rubber surfaces is they cannot be used entirely on their own. They need a base, and sand, ideally silica sand, is best. I have ridden on a number of these schools. The biggest problem I had was that when they are wet a black sandy substance covers the horses legs – especially frustrating with a grey! Sand was traditionally very popular, but nowadays more people are using a combination, such as sand with a topping of rubber or a sand-mixed product. Sand used for arenas is silica sand, which is natural but more durable than most. Horses tend to travel on top of this rather than move through it. A sand-mix surface is the kind I aspire to have. Surfaces that have been treated with a wax coating, usually sand mixed with synthetic fibres, have particles that bind together more effectively and there is less surface movement. They need less maintenance than their unwaxed counterparts. They should allowing for “bounce” and absorption of impact. This substance tends to be used at centres that want something durable and really nice to ride on.